Migration is a phenomenon that affects individuals and societies multi-dimensionally. Migration, whether voluntary or forced is a troublesome process for immigrants, because everything in their lives changes. Migration affects both immigrants and local people who live in migration areas. 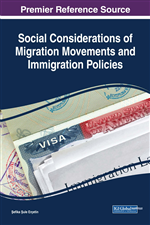 In this study, economic and educational effects of migration are discussed. In fact, in many places and in many countries, governments help immigrants with basic vital needs and if immigrants try to continue their efforts to establish new order, many them do succeed. Several precautions have been taken for immigrant children in many places such as language courses, training and financial aid in many countries to improve on the educational performance of immigrants. If we look at the other side of the coin however, social inclusion, discrimination, stigmatization experiences of immigrants should also be searched, because the social dimension of migration is still an open sore in many places of the world. Migration phenomenon has been on the agenda of Turkey with population exchanges, settlement laws or internal and external migration flows with more economic reasons (HÜNEE, 2006). In Turkey, the changes occurring in rural areas after 1950 exposed the major cities to mass migration of the period (Işık, 2009). In these years, migration was intense from rural to urban areas with the effects of industrialization and urbanization (Koçak and Terzi, 2012). Usually, migrations as a result of driving factors arising such as rapid population growth in rural areas, mechanization, low income, inadequate infrastructure and services (Gedik, 1997, p. 171) were also reflected in the geographical dimension of urbanization; migration towards big cities which was limited to Ankara before 1950 has spread to other cities such as İstanbul, İzmir, and Adana (Tümertekin, 1968, pp. 40-41).